Averages don't tell the whole story in this case. Microprocessor giant Intel (NASDAQ:INTC) is known for its industry-leading gross profit margins. Though the company's gross profit margins are down from the peak of 66% seen in 2010, the company has managed to achieve greater-than-60% gross profit margins annually since 2014, after dipping slightly below 60% during 2013. Investors (and companies themselves) like higher gross profit margins for one simple reason: The higher those margins, the more of each dollar of revenue Intel can ultimately convert into profits. Even with this in mind, as investors assess new business opportunities that Intel might go after, it's important that they recognize that there are actions that the company can take to dilute its reported gross profit margin percentage while still delivering increased value to shareholders. I'd like to walk through such an example. One market that Intel executives seem to be extremely excited about is non-volatile memory. Intel's plays in non-volatile memory include NAND-flash-based solid state drives, as well as products based on Intel's and Micron's (NASDAQ:MU) jointly developed 3D XPoint technology. On a recent investor call, Intel executive Stacy Smith made it clear that he thinks that, on its memory products, it will "make good margins" and even "better-than-industry margins" but was quite plain that gross profit margins on non-volatile memory products are "highly unlikely" to be at Intel's current corporate average margins. What this means is that if Intel's revenue from non-volatile memory products grows at a rate faster than the rest of the company's business, Intel's overall gross profit margin percentage should decline. Now, the extent of that decline isn't likely to be all that significant in the near-to-medium term as Intel's non-volatile memory business is quite small, but over time investors may start to notice gross profit margin "dilution" if that business takes off. Isn't a decline in gross profit margin bad? 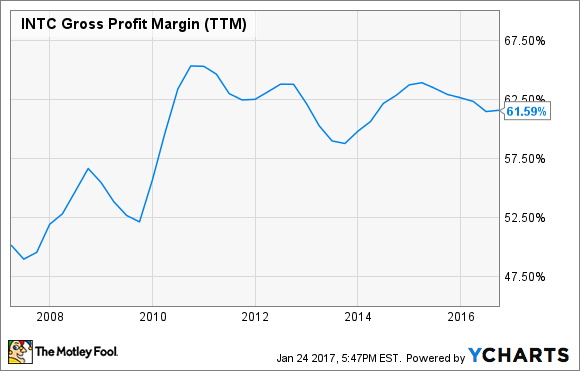 Declines in a company's average gross profit margin percentage aren't always bad -- it really depends on why that figure came down. A gross profit margin decline resulting from fast growth of a lower-margin business relative to the higher-margin businesses isn't necessarily a bad thing. Remember, even if the gross profit margin percentage comes down, the total revenue to which that percentage is applied is much higher. In other words, operating income and net income would increase, ultimately increasing the value of the business, even if the average gross profit margins come down. Indeed, Smith even said on the aforementioned investor call that Intel doesn't want to "truncate growth in certain segments to hit a corporate average" gross profit margin. Now, what investors do need to be mindful of is a gross profit margin decline that's not simply due to dilution caused by a fast-growing-but-low-margin business. So, for example, if Intel had previously been able to command 65% average gross profit margins on, say, its data-center chips, but some combination of competitive pressures and manufacturing cost structure problems (perhaps from lower-than-expected manufacturing yield rates) leads those margins to come down to 62%, then that's a problem. In that case, the total revenue to which the gross profit margin percentage is applied hasn't gone up -- it may have even gone down -- so total operating profit and, ultimately, net profit decline. Those kinds of declines negatively affect earnings per share and, in many cases, the stock price. At the end of the day, it's important for investors to avoid looking at financial figures without keeping a close eye on the bigger picture. Gross profit margin percentage is a critical figure to Intel investors, as it has historically been a measure of the company's competitive positioning in the markets that it serves. Nevertheless, company starts to diversify into new, potentially more competitive markets like non-volatile memory, it will be important to focus on the operating margins of each individual Intel business rather than on the consolidated gross profit margin figure. As Smith put it, Intel wants to make sure that "every business is growing, every business is expanding its operating margin." If Intel can consistently achieve this goal, then it should be able to generate additional value for its stockholders through increased profits and thus earnings per share. We'll see how the company does over the next several years.